On Thursday 26th May 2016, two IWOC members from the West Midlands attended a protest at the Holiday Inn in Sutton, where G4S was holding its Annual General Meeting. 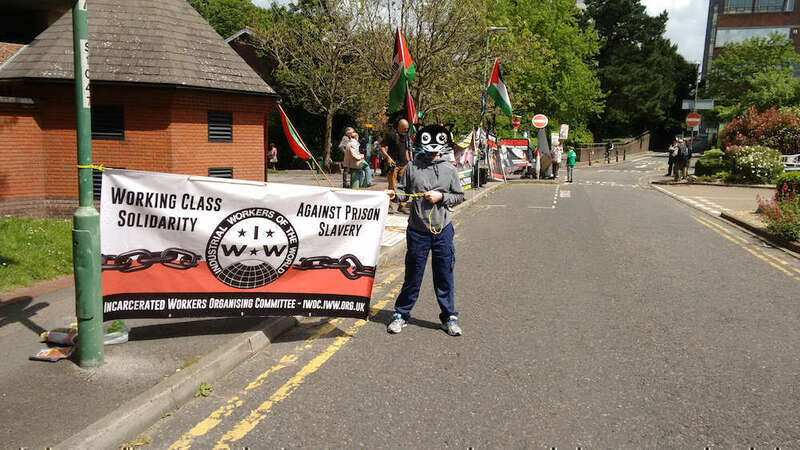 The demonstration consisted of approximately 50 pro Palestine supporters, who were there to draw attention to the involvement of G4s in the detention and torture of Palestinians. The first question that sprang to mind was: why do we let this company anywhere near people? Not only does it mistreat prisoners in UK prisons, it is complicit in the torture of Palestinian children whose alleged crime was throwing stones at Israeli soldiers. For this “act of terrorism” they are detained without trial, tortured and their families persecuted. It was right and proper, therefore, that the IWW leant its voice to this protest given its support for Boycott, Divest and Sanction. 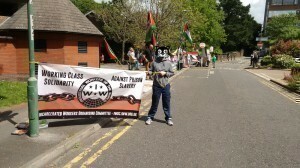 However, we were there to draw attention to the G4S involvement in the UK Prison Industrial Complex (PIC). “Subbing out” the PIC is convenient for oppressive regimes. Private companies are not bound by freedom of information rules. They are not subject to public scrutiny and they are not accountable to an electorate. This leaves governments free to carry out contentious prison “reform” whilst retaining the deniability option. The PIC is as much a part of the neoliberal agenda as the so called “flexible labour market”. Privatising prisons and allowing private service providers to run them, allows the prison system to be self sustaining. They can be financed using the wealth created by low cost labour. The “free” workers in them can be given poor conditions of service, little or no training and zero hours contracts. The owners of the companies running the prisons are substantial contributors to the neoliberal, political parties, which they control through this form of bribery. Win, win win for the bosses. It is shameful that the UK Home Secretary’s husband is a major G4S shareholder with substantial influence in the company. Is Mrs May on commission? The protest itself was noisy and visible. 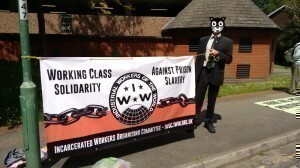 The fatcat shareholders present at the G4S AGM would have seen and heard us. The IWOC banner was positioned so that the passengers in the “limos” going into the hotel could not have missed our message. 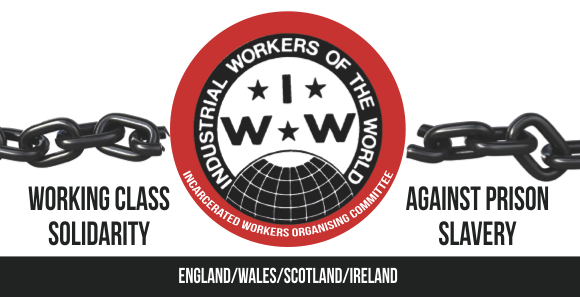 We, the IWW WISE-RA, are not going to let you get away with this scam!